"You know, ordinary life is pretty complex stuff." Despite what you may have heard, Harvey Pekar is not the everyman. Though his life is captured in the panels of a comic, he is a real person. He is what one may consider "salt of the earth," but like too much salt, too much Harvey would be unhealthy for our society. However, there is something enduringly human about this eccentric, complex man, whose tendencies have caught the attention of David Letterman, comic book fans, and literary critics alike (an odd combo). He has mental issues that affect his life in innumerable ways, but then again, which of us does not have the occasional mental tick? These unique attributes energized the underground comic book scene, and have been brought to the screen in a frame by frame fusion of fact and fiction. 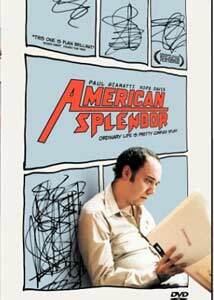 This is the story of one man�a little tale called American Splendor. Harvey Pekar (Paul Giamatti) is a resident of Cleveland, Ohio. He is cheap, depressed, nervous, obsessive compulsive, unable to maintain a marriage (he has already blown two) and has a history of health problems. The latest is the loss of his voice from constant temperamental outbursts. He has been this way since childhood, when he never bothered dressing up for trick-or-treating�he was just interested in the "swag." Still, Harvey is a good man who is trying to make his way, despite his self-admitted lack of strength. Coupled with the superb Ghost World, this film has convinced me that comic books and jazz records go hand in hand. Pekar collects both, along with holding down a menial job as a file clerk at the local V.A. hospital. This is a dismal forecast. Where does the successful comic book come in? Where is the fame? Where is the fortune? Like many good tales, fortune comes through a chance encounter. After meeting renowned comic artist R. Crumb (the quirky James Urbaniak) at a garage sale, Pekar decides to infuse his life of frustration into a comic book. His hero is not an idealized Kryptonian, but a man named Harvey. When American Splendor takes off, Pekar colors his tales with real people who occupy his life: His "genuine nerd" co-worker Toby Radloff (Judah Friedlander), who will travel hundreds of miles to witness the Revenge of the Nerds; Mr. Boats (Earl Billings), another co-worker who makes odd observations and is tired of buying junk records from Harvey; and of course, Harvey's beloved third wife Joyce (Hope Davis), whose maternal tendencies, love for comic books, and preference for chamomile tea made their connection a match made in, well, somewhere around the block from Heaven. Of course, life gets complicated and "our man" has plenty to deal with before the tale ends. How does one capture such a subversive product of popular culture? Directors Robert Pulcini and Shari Springer Berman have fused Harvey's real life and his comics with comedic film and documentary into a supremely entertaining portrait of Harvey. The film flows freely between pieces of Harvey's life, the printed page, and interviews with the real Harvey and Co. Pekar's life is brilliantly depicted by the overlooked Paul Giamatti, who perfectly captures the posture, facial expressions, and vocal nuances of the real Harvey. Hope Davis is wonderfully caring, honest and ambitious as Harvey's wife, who spares him from insanity on several occasions. Judah Friedlander's Toby looks and speaks so much like the real thing, it is simply frightening. Interceding with these sequences are comic book elements: frames appear within frames, thought bubbles pop up, and animated drawings of Harvey personify his inner monologue. To top it off, documentary sequences comment on the tale that unfolds before us. The real Harvey elicits great laughs in his interview scenes, in which he sits on a blank white soundstage, surrounded by folding chairs, comics, jelly beans, orange soda, and occasionally, his friends and family. This is a hilarious and touching journey that seamlessly blends various styles and messages, all of which have to be experienced to be appreciated. This humble review can only scratch the surface. If it is said that art imitates life which imitates art (and so on), look no further than this film for conclusive proof. Some may say that Pekar's talent is small, considering he simply writes down what happens to him. Not so. He is a lens through which details and observations made by Pekar are focused into an intense commentary. This is illustrated beautifully in the film. The life of a man that was captured in frames of a comic is now on frames of celluloid. Hands down, this is one of 2003's best films. Image Transfer Review: The picture quality is a mixed bag. Most of the film was shot on 35mm, but the interview portions were shot on hi-def tape. As a result, each medium displays different levels of quality. The 35mm segments capture the film's brownish color palate well, and contrast is good, with deep blacks. The opening scene is quite different stylistically, showcasing a more harsh contrast and what appears to be a "bleach bypass" look (a blown out look, similar to Janusz Kaminski's recent work for Spielberg). Edge enhancement makes some minor appearances when characters are against light backgrounds. Shots vary in clarity, though. Some are rock solid, exhibiting little grain and fine detail. Others look softer, and show a fair amount of grain. These attributes intermingle at times, creating a less than consistent presentation. The hi-def portions are very clear, but show the limitations of the source. Still, this looks like a faithful representation of the theatrical presentation quality. Audio Transfer Review: The provided Dolby 5.1 track is well done. The mix is rather front heavy, but the surrounds kick in for ambient effects, music and to enhance the film's brilliant editing. Don't expect impressive split surround effects, but channel separation is good all around. LFE is present, especially when Harvey's jazz kicks in during the film's montages. Dialogue is clear and overall, the mix serves the material well. The alternate Dolby Surround track makes for a fine Pro-Logic presentation, but go with the 5.1 if you have the capability. Extras Review: HBO has provided a relatively small, yet quality collection of extras contained within some creative, comic inspired menus. First, there is a great feature-length commentary with Harvey Pekar, Toby Radloff (who is hilarious here), Joyce Brabner, Paul Giamatti, Robert Pulcini, and Shari Springer Berman. While the "real" people comment on the film with many entertaining opionions and anectodes, the filmmakers chime in, explaining the film's production, including many technical aspects. This is a great, varied track with a lot of solid interplay that is well worth a listen. Next is a featurette entitled Road to Splendor (05m:27s). This showcases American Splendor's journey through the film festival circuit (including Sundance and Cannes) and its eventual domestic premiere. It is a fun little piece that includes the comical reactions of the real Harvey and Co., along with the cast and crew. Eytan Mirski's song written for the film, appropriately entitled American Splendor, is presented over a still menu screen in 2.0 stereo. The theatrical trailer is included, along with a trailer for HBO Films, which advertises the many current HBO DVD releases, and some that are on the way. A Downloads section includes DVD-ROM instructions to access a screensaver, wallpaper, and Harvey Pekar's website. The final and most unique extra is included in the keepcase on top of the insert: A 12-page comic entitled My Movie Year, which chronicles some events from Harvey's life, and the long, drawn out journey of bringing American Splendor to the screen. The comic is written by Harvey Pekar and illustrated by Gary and Laura Dumm. I also found three easter eggs. First, go to the special features menu, which is set up to look like a fast food drive through menu. If you find the hot-spot, you'll see a very funny short piece (01m:02s) on what it means to be a genuine nerd, with Toby Radloff and Judah Friedlander. On the same menu, a list of DVD credits can be accessed by hunting as well. Finally, go to the last page in the chapter selections. Your search will reward you with a short interview with Hope Davis on how she had a hard time keeping a straight face working with Paul Giamatti (01m:15s). I would liked to have seen a piece on the film's visual effects, but what is included is solid. American Splendor is one of the year's finest films. Its innovative blending of animation, drama, comedy and documentary create a funny and emotional exploration of one screwed up man, Harvey Pekar, and his entourage of acquaintances. Luckily, you don't have to drive 260 miles (round trip) to Toledo to see it. Highly recommended.